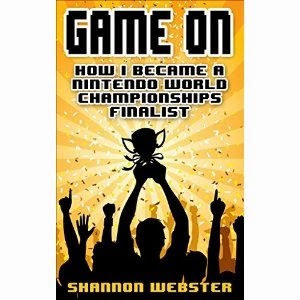 Today we are interviewing Shannon Webster, author of the esports book Game On | How I Became a Nintendo World Championships Finalist. I was born and raised in Nebraska but now reside near Mount Hood, Oregon. I have a degree in Business and am a small business owner. Reading is my favorite pastime and I am always lost in a good book. I've often considered becoming a writer and Game On is my first attempt at writing a book. Describe your book, Game On, for us. When I was a teenager I entered a national video game tournament called the Nintendo World Championships. I won the city tournament in Denver and went on to compete at the NWC Finals in Hollywood. The book is my story of how I first became interested in video games and later my experiences competing in the tournament. More than video games, it's a coming of age story. How did you get interested in video games and becoming a video game champion? I didn’t start out wanting to become a video game champion, it just sort of happened along the way. I go into it in more detail in my book. I can tell you that home video games were a new experience back in the 1980s and there was a lot of excitement around the new technology. Video games had become such a craze nationally and me learning about the 1990 Nintendo World Championships and giving it a shot was just my way of being involved in that growing frenzy. What made you decide to write a book about your Nintendo World Championships experience? Well as you can imagine, my experience in the NWC is a memory that I treasure. During the months and years after the tournament I would often replay the experience in my thoughts so I could relive the events and how I felt at the time. Several years back when I was in college, I sold my NWC cartridge and the buyer had a lot of questions about my participation in the event. At that point I went ahead and typed out most of what I had experienced and sent it to him. After that, the story just sat on my hard drive. It has now been 25 years since the experience so I thought that it would be a good time to publish the story. So I went back and rewrote and added to the story I already had. It took several months to write my story when I was in college. I didn’t have time to give it the attention to detail that it deserved. So in my recent work on the story, I’ve spent another several months adding in detail and sharing more of my emotional experience before and after the tournament. It is a short book. However, it’s my story just as it happened. I didn’t embellish or add in anything to pad the page count. Ultimately you didn’t become the Nintendo World Champion, any regrets? At the time, I was really let down that I didn’t win the final tournament in Hollywood. I had spent so much of my emotional energy on being a competitive gamer. But looking back now, I think that in a way I’m glad that I didn’t win the final tournament. To be the Nintendo World Champion would be way too much pressure! In the years following the tournament, when I would play games with others, I always felt I had to live up to my status as an NWC Finalist. If I was competing against other gamers and I beat them seven out of ten times, I would feel disappointed in myself for not being even more dominant. If I were the Nintendo World Champion, I would feel the need to be absolutely perfect at all times and who needs that kind of pressure? What has playing video games taught you? If you want the short, clichéd answer; it’s to dream big. It amazes me how in childhood everything seems possible. Kids tell themselves “when I grow up, I want to be an astronaut” or other such lofty goals and it all seems perfectly reasonable. When I was a teenager and I was talking my mother into taking me to multiple video game tournaments she never told me “now son, the chances of winning something like that is very unlikely.” Instead she indulged me and I felt that I really had a shot. It didn’t occur to me that doing something on that level was supposed to be close to impossible. As we grow up we start to realize how difficult things really are and that maybe being an astronaut isn’t a real possibility. However, as I found out when I was younger, if you truly believe in yourself and show faith in yourself you can achieve what you want if you persist. So I guess that video games taught to me that I don’t have to settle for mediocrity in life.